Welcome to the March SU Stars Blog Hop! If you're following the hop, you probably arrived from Denise Foor's blog here. You can also follow the entire blog hop by beginning at our SU Stars homepage here. My spring card is a bit of a change from my usual style. It's always good to stretch! I used the Sale-a-Bration set, "Bliss." It will be gone in a few more weeks and I wanted to showcase it on my blog. I also tried "ribbon scrunching." It's very popular, but I hadn't used it on a card yet. I didn't design it from scratch, though. I used Pals Paper Arts sketch 85 for the design. I also found a new blog with a color challenge. The Paper Players color challenge 38 gave me the color scheme for my card. I like that it is spring-y and bright. You can see the sketch and the color challenge below. Now be sure to go to Loni Holt's blog. Loni is a great woman and amazing stamper. You can see her creation here. Very pretty! Thanks for joining us at the Paper Players! Beautiful! I love the ribbon! Thanks for playing with Pals Paper Arts and The Paper Players! Angela, great card and love the color combo and sketch. 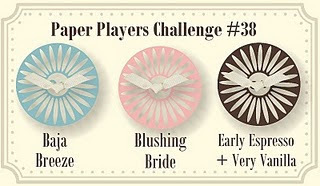 I love the paper players too!. Thanks for sharing. Love it! You're card is beautiful and I love the ribbon. Great job with the challenge! Thank you for playing along with Pals Paper Arts.